Home > Starting Out > What is Drawing? 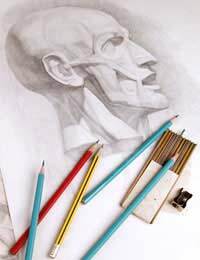 Drawing has a number of primary functions that differ according to the intended outcome. Primarily, drawing is seen to be any form of marking a surface with a view to creating a two-dimensional image. Common tools used for drawing upon a two-dimensional surface include pencil, coloured pencils, graphite, charcoal, compressed charcoal, ink, pastel, wax crayon and oil pastel. See related articles for more information on these differing media. Drawing is sometimes used as a preparation for a painting, either as an observational sketchbook exercise or as a preliminary to painting upon canvas, as a means of mapping out where different areas of colour will go. For this reason it has a close relationship with painting, and even crosses over with it, as some ink and brush techniques differ little from painting at all: In these instances it becomes clear that drawing is generally seen to be a process of drawing with 'line' using an implement that creates friction with the surface, thus leaving a mark on that surface. The principle aim of drawing is to record events, images or ideas using the friction between the drawing implement and the draw-upon surface to leave a mark that can be referred to in the future for reference or entertainment. There are several broadly differing types of drawing that all employ the above means of recording phenomena. Principally they do not differ that much and some forms even cross over into one another. For example, graphic design, whilst being methodical in its approach and having a defined purpose can be appreciated as art. Similarly, art can be used to inspire design, as can often be seen in fashion and architecture. Drawing is principally comprised of tone, line and (sometimes) an awareness of 'perspective' (the illusion of three-dimensional space). It sometimes utilises colour, although this is seen as a secondary component of drawing, as colour is the principle domain of painting, and now colour photography. Using the elements of tone, line and perspective attempts are made by artists to convey 'reality' in a manner that is 'expressive' or in a way that is more realistic (often called 'academic drawing' or 'realist' drawing. In both cases an attempt is made to convey an existing reality. In many cases an attempt is made in this way to affect the viewer and to in some way change reality through political and social comment, or just by making the viewer stop and stare. This type of art usually falls into the remit of 'Fine Art', whilst drawing aimed at imaging something and bringing it into being on the page, with a view to later producing that thing generally falls into the 'design' remit. Very broadly, design is seen as of a practical and 'useful' nature, whilst Fine Art drawing is seen as of a creative nature, without a purpose other than the contemplative and entertaining sensation evoked in the viewer of the artwork. In any case (and we will see throughout the following articles that nothing is clear cut) the artist when drawing aims to build a repertoire of mark making skills in order to best express the tone, colour and texture of what they wish to convey. It is a good idea for the beginner artist to build this repertoire by keeping a sketchbook in which to record as many visual experiences as possible - merely noting them through mark making as they arise in day to day life. In this way skills can develop which will be at hand when needed later on in the artist's development.